Lattes Montpellier made no mistake at the Open LFB and came away with the victory (73-60) against Saint Amand Hainaut Basket. It was not a classic match. However Montpellier made the crucial shots at the right time and had better control of the rebounds. Saint Amand missed Clémence Beikes who was not able to play. During the match they suffered a major blow with an injury to Marina Solopova. For Montpellier Stephany Skrba was the player of the game with a a double-double 17 points and 14 rebounds while Gaëlle Skrela, Edwige Lawson-Wade and Kirsten Mann all finished in double digits. 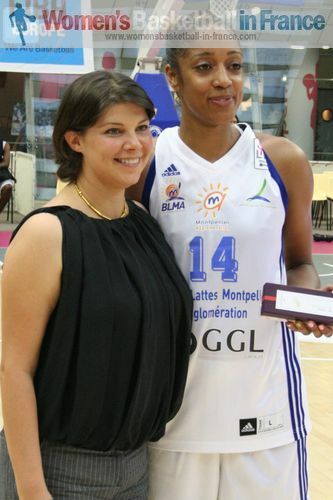 Amisha Carter from Saint Amand was the top scorer of the match with 21 points while Ashly Houts added 12 points. After a close first quarter in which Montpellier never trailed (24-19). They stepped on the accelerator during the first six minutes of the second quarter with a 17-0 run to open up a 20-point lead (41-21) with 16 minutes played. Things became more complicated for Saint Amand when Marina Solopova (left) went down after a bump into Mathilde Roche. Solopova was on the ground clutching her ankle for a couple of minutes before being helped off the court. Montpellier dropped the pace allowing Saind Amand to finally get a basket. Yet Montpellier went into the locker room leading (48-27). The start of the third quarter was equally balanced with both teams trading baskets despite Saint Amand losing Emilie Silbande-Petiteau for the rest of the quarter with her 4th foul. Montpellier controlled the pace while Saint Amand huffed in an entertaining third quarter (57-41). Saint Amand were more aggressive during the final quarter but they were not able to bring down the deficit. A tree-pointer by Amisha Carter on the buzzer for Saint Amand was the major highlight of the second half.